The user interface on Nokia's Asha 501 has a new homescreen that allows users to see recently accessed contacts, social networks and apps. 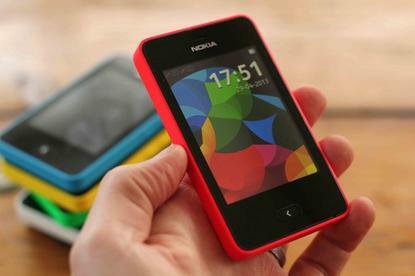 Nokia has upgraded the Asha 501 with WhatApp, Microsoft Exchange ActiveSync features and voice-over-IP. While waiting for the completion of Microsoft's acquisition of the company's Devices & Services business, Nokia has continued to work on improving the competitiveness of the Asha family in the face of almost insurmountable competition from cheap Android-based devices. The Asha 501 was originally launched in May. The GSM phone has a 3-inch screen, a 3.2-megapixel camera, Wi-Fi and a choice between one or two SIM cards. Offering the latter has become a must in many developing countries. The list price at the time of the launch was US$99 without taxes and subsidies. The update brings the software in line with what's used on the recently announced Asha 500, 502 and 503. Once users have received the software update, they can download the WhatsApp client and start sending instant messages. The software lets users make voice calls over data connections using social messaging apps such as Nimbuzz to start, with more coming soon. For enterprise users, Nokia has implemented Microsoft Exchange ActiveSync features, as well. The update isn't just about third-party applications. Nokia has also made improvements to the underlying operating system. Users can, for example, swipe on the screen to start the camera; long press to access camera settings; and swipe to switch from the image mode to the video mode or vice versa. A key feature in the user interface is Fastlane, which shows recently accessed contacts, social networks and apps. It can now be personalized by users, who can choose what content they want it to show. On the Lock screen users can now choose to see full notifications or notification icons, so that others can't see message content. Earlier this week Nokia also announced a beta version of Here Transit for the 501 as well as the 500, 502 and 503. The app, which is already available on Windows Phone, helps users get around on public transport. The future of the Asha family won't be decided until Microsoft's acquisition is closed during the first quarter. But even if the phones don't run Microsoft's OS, the company can ill-afford to get rid of it until Windows Phones can be offered for well under $100 without subsidies. That's because much of the growth is expected to come from this segment of the market, as users in developing parts of the world buy smartphones.